•"It does have email and it is already set up for AOL/GMAIL/HOTMAIL etc.. and you can use your own POP email address." •"Not worth the $500-$600 IMHO maybe half that." •"I must say it has very fast response to input and very good resolution on the LCD it is very crisp and vivid." •"The phone has a super top secret feature that I can't even be told what is (anyone have a clue?)." •"Web browsing is pretty fast as well." Although I got our hands on with an early preproduction model in January, it's nice to hear from someone who's held the production model. I don't agree with all he's said (particularly the price not being worth it) but I know you guys are tired of me ranting about this phone, so a little outside perspective can't hurt. All will be revealed on the 29th of June. IFOApplestore.com, run by the guy who covers the Apple retail scene, says that the AT&T stores will have very low numbers of iPhones to sell, "perhaps fewer than 40 units." I know Jobs had said to A. Huffington that he recommends people going to AT&T stores, where the lines are going to be shorter, but if that report is true, most people should probably line up at the Apple Stores. 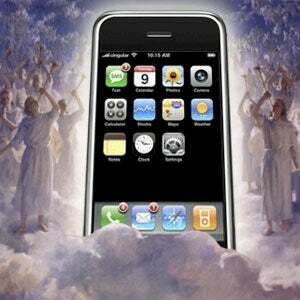 Also interesting (but I think I've heard it before) is that Cingular is installing repeaters at all Apple stores to ensure good reception for the Jesus Phone. As always, thank you to our tipsters. Giz just wouldn't be the same without you. If you've got something to share, drop me a line.